VirusBattle uses a RESTful interface and thus can be accessed with any programming language. This wiki documents the command-line access. Documentation of the python package access and RESTful interface will be developed later (on demand). 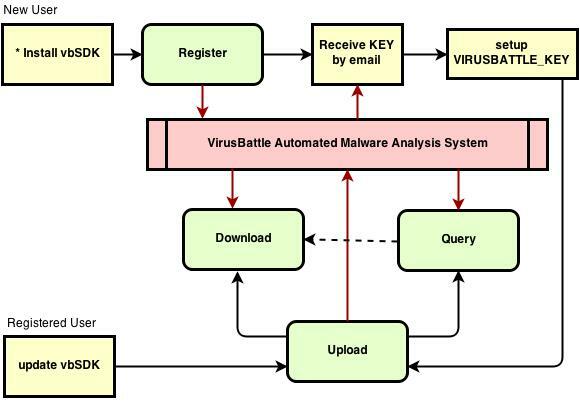 VirusBattle provides the following automated malware analysis services. Unpacking: Unpack PE-32 files for a large variety of unpackers using VM Introspection- monitoring execution below ring 0. Reverse Engineering: Calculate abstract semantics- BinJuice of basic blocks in disassembly, generate Callgraph Graphs, APIFlow Graphs and extract strings. Semantic Matching: Make code similarity queries at both procedure and binary levels of granularity.